Help Prevent and Cure Them? Mirella Poli a published chinchilla author, has put together an amazing eBook called the Chinchilla A-Z Health & Sickness Bible. Imagine what it will be like when your chinchilla is sick and going 'down hill' rapidly - no vets are open and you don't know what is wrong with them. That's where this unique eBook dedicated solely to chinchilla sickness and disease can help you! It really is possible - you just need to know what to do and how to help your chinchilla. Become a Chinchilla Expert and Identify 150+ Different Illnesses Sooner. Every single page of this unique eBook is packed with expert advice by a published chinchilla author. It took over 8 years to gather over 200 photographs and images, research over 150 different illnesses and compile all the ground breaking information into this amazing 220 page eBook. But that's not all...The above is just a tiny fraction of the amount of information you will discover within the jam-packed pages of the Chinchilla A-Z Health & Sickness Bible. This eBook has been written in plain 'easy-to-read' English by a reputable chinchilla author who has not over complicated the book with technical jargon. Unique medical photos (which you will not be able to find anywhere else), have also been included in this amazing eBook and illnesses have been listed in alphabetical order for a 'quick-to-find' reference guide. Lets be honest - You can spend hours and hours of time searching through countless websites for urgent information or buy alternative books and you would not come close to the amount of information that has been packed into this huge eBook. Best of all...This eBook comes with the credibility of being written by a published chinchilla author and numerous amounts of customer feedback to help give you peace of mind to its excellence. If you like what you've heard so far then you can get your hands on this amazing eBook by ordering your personal copy via Paypal. That's why the Chinchilla A-Z Health & Sickness Bible is a 'must have' for all chinchilla owners - new and experienced and at a bargain price! Why Is The Chinchilla A-Z Health & Sickness Bible So Cheap Considering It Is Packed Solid of Medical Information? Simply this is a digital eBook so the cost to deliver it to you are small compared to if this huge eBook had to actually be printed and sent out. 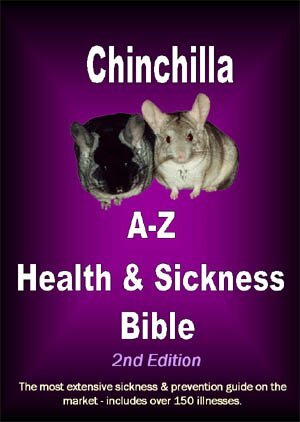 The Chinchilla A-Z Health & Sickness Bible has 220 pages and is full of the latest information and since it is an eBook you can download it to your computer within no time at all and start to become an expert with the latest information you will discover. Don't be fooled by other eBook's out there written by unknown authors - most just pull information off various websites and sell you what you already know! The Chinchilla A-Z Health & Sickness Bible has been written by an experienced 'published' chinchilla author who has spent over 8 years collecting the latest ground breaking information on illness prevention from experience, veterinarian advice and manuals and combined it into an amazing 'one-off' eBook just for you. Many chinchilla owners have already discovered the secrets of this amazing eBook and now own happy healthy chinchillas. Included DRM security makes the Chinchilla A-Z Health & Sickness Bible your own personal copy and is as 'cheap as chips' considering what information you will discover in this fantastic eBook. You will never need to search for information again regarding an illness or disease as all the information you will ever need is right within these pages. The eBook is fully compatible with Mac OS Mavericks (10.9x), MacOSX and the following 32-bit & 64-bit operating systems: Windows 2000, XP, 2003, Vista, Windows 7, 8, 8.1 & Windows 10. Because we are SO confident in this product, we are happily offering a 100% RISK-FREE MONEY BACK GUARANTEE to anyone who can find another chinchilla book on the current market so comprehensive and informative! especially after the age of 3.
occurs in chins over 3 yrs.